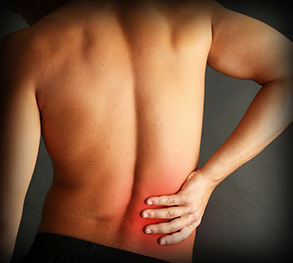 Treatment of back pain has undergone a recent sea change. Experts now appreciate the central role of exercise to build muscles that support the back. 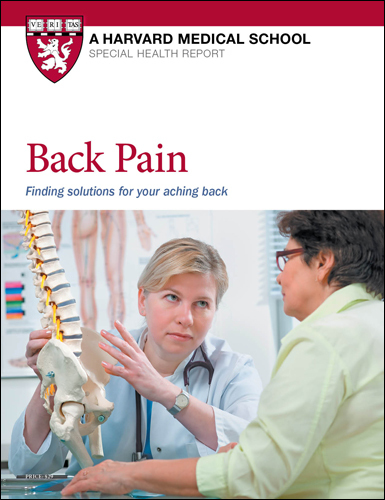 This Special Health Report, Back Pain: Finding solutions for your aching back, helps you understand why back pain occurs and which treatments are most likely to help. This report describes the different types of back problems and the tailored treatments that are more likely to help specific conditions. When back pain strikes, you may think the best way to get relief is to sit still or lie down until the pain goes away. But we now know exercise can be key to treating back pain. In fact, thanks to the pioneering work of back pain researchers, effective treatment has undergone a sea change. The reason your abdominal muscles are so important to your lower back. Why MRIs and X-rays are considered overused when it comes to most back pain. Why the best approach to back pain is “wait and see” unless you have a red-flag symptom. “Just-in-case-tests” that could lead to unnecessary surgeries. Why 90% of people with sciatica or herniated discs will recover on their own within 6 months. Diagnostic imaging: When it is and isn’t useful. What tests can help diagnose back pain? There are times when imaging tests are appropriate. If the pain becomes chronic—that is, it persists with little or no improvement for three months or more—imaging studies and other tests can help identify the source of the pain and rule out serious problems. If your doctor thinks you might have a serious condition such as a tumor, infection, or cauda equina syndrome, advanced medical imaging could save your life. If you and your physician agree an imaging test may be helpful, here are some of the standard options. are indispensable for identifying fractures as well as changes in the bones associated with tumors, infections, and certain forms of arthritis. X-rays expose you to some radiation, but the doses are low. In the absence of other significant radiation exposure, occasional x-rays don’t pose a significant danger. CT imaging provides distinct outlines of the various structures of the back, such as the vertebrae. While CT scans can show arthritis or spinal narrowing (stenosis), they may not indicate clearly whether a herniated disc is causing a problem, such as sciatica. During a CT scan, you must lie still for 10 to 15 minutes on a table that slides into a tunnel-like scanner. An x-ray device moves along your body taking multiple pictures from slightly different angles. Instead of sending a single x-ray beam through your body, this device uses many narrow beams. A detector that rotates around you collects the beams and sends the information to a specialized computer, which instantaneously analyzes and synthesizes multiple images of your back. The result is a set of remarkably detailed views. CT has one important downside: the scanning exposes you to much more radiation than a conventional x-ray. MRI technology uses electromagnetic waves to create images of your tissues, thus avoiding the radiation hazard of x-rays and CT scans. Unlike CT, MRI creates images of soft tissues, including intervertebral discs, spinal nerves, and tumors. The MRI procedure usually takes about 45 minutes.You lie motionless on a table that slides into the center of the donut-shaped scanning machine. The machine bathes you in a strong magnetic field and probes the body’s water-rich soft tissues with radio waves. The resulting scans are extremely detailed. MRI scans are expensive, but when used in conjunction with a medical history and physical examination, MRI can eliminate some of the guesswork involved in making a diagnosis. Myelography is a form of diagnostic imaging that shows the positions of the lumbar nerve roots—the nerves that exit the spinal cord between pairs of vertebrae in the lower back. This sensitive procedure can also indicate distortions in the shape of the fluid-filled sheath that surrounds the spinal cord and the cauda equina. It works this way: The doctor first injects a contrast medium (a fluid opaque to x-rays) into the spinal canal. This allows a type of x-ray machine called a fluoroscope to observe the flow of the contrast medium through the space around the cord and the nerve roots. The resulting images reveal abnormalities such as herniated discs, stenosis, or spinal tumors. sheath around the spinal cord with a needle. Some people find it to be quite uncomfortable. Possible complications include headache (occasionally severe), an allergic reaction to the contrast fluid, and even infection resulting from the lumbar puncture, although this is rare. Myelography is performed only when a diagnosis is particularly difficult or when it’s necessary to pinpoint the location of a problem in preparation for a complex surgery. In such cases, myelography can be done in combination with CT imaging.